The fourth title in the Need for Speed series is called Need for Speed: High Stakes (USA) or Need for Speed: Road Challenge (Europe, Asia). Again Electronic Arts managed to make the game even better than its predecessor. Find out what's so good on this game in our review. If you want to experience NFS: High stakes yourself, then try out the fantastic demo. You want to make the game even more fun? Check out the cheats section! 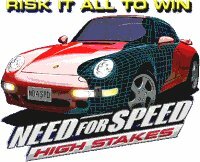 If you're looking for detailed info on the cars and tracks in NFS: High stakes you might want to check out the cars or the tracks section. Also, for NFS: High Stakes will be, probably, edited cars available, check out the edited cars section if you want to download the latest edited cars.